It's Interview Season. This is the time of year that our Admissions team packs our suitcases and heads to major U.S. and Canadian cities to meet one-on-one with qualified applicants for the January, May and September 2014 start terms. They came from as far away as Lebanon and Tanzania and as near as a kilometer from the Campus in St. Vincent and the Grenadines to begin the Doctor of Medicine (MD) degree program at Trinity School of Medicine. The new arrivals were greeted by Trinity's Student-led Welcoming Committee who ensured that students and their families were met at the airport and delivered to their residences especially appreciated through flight delays and midnight and later arrivals. Unlike the big schools where students are on their own to secure housing, incoming students are all placed in Trinity-managed student housing based on their preferences and habits. All of Trinity's residences are serviced by the school's shuttle buses with scheduled pick up and drops off multiple times per day. Most of the facilities include maid services and utilities. And on weekends the school provides transportation into town for shopping excursions. 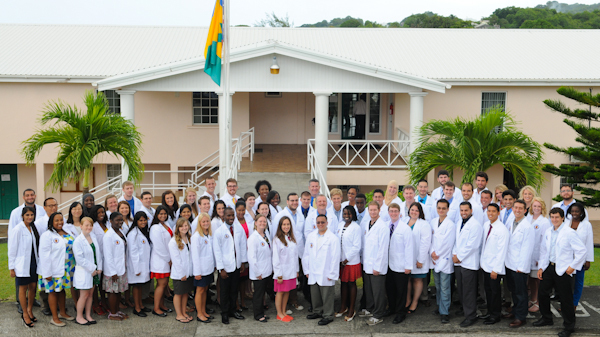 By virtue of maintaining the comparably small size of each incoming class, Trinity is able to offer our students many amenities and services impossible to provide for the 300-600 size classes that many of the Caribbean medical schools bring in each term. Next on the agenda was a campus tour and Welcome Session hosted by the Student Government Association and the Trinity Administration. Residence Advisors, Administration and St. Vincent government representatives spoke to the group about life in St. Vincent and how to make the most of their beautiful new island home. A tour of Kingstown followed where students were able to shop, dine, bank, and explore.